The High Holy Days services will be at the following date / times. Sunday, September 9th — 7:30 p.m.
Monday, September 10th — 10:00 a.m.
Monday, September 10th — 2:30 p.m.
Tuesday, September 18th — 7:30 p.m.
Wednesday, September 19th — 10:00 a.m.
Children’s Service (no ticket required), 2:30 p.m.
Yizkor (no ticket required) 4:30 p.m.
Ne’ilah (no ticket required), 5:30 p.m.
We use the “Gates of Repentance” prayer book. It is available at Frank’s Hebrew Book Store in University Hts., or online at various retailers. 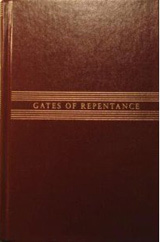 The Temple has a limited number of prayer books available for loan during High Holy Days. They are free to anyone who needs them. However a donation to the “Rabbi Fredrick Eisenberg Music Fund” would be appreciated. That fund helps pay for the High Holy Days Choir.